This past Thursday for me was just like any other Thursday; everyone was on their way to work in the morning, stores and businesses were open with normal business hours and mail was delivered to our box. Anna, my 13 month old daughter, was very sick with a bad head cold and a fever of 101° F that day so I was overwhelmed with a crying, tired and clingy baby all day. Turkey was the last thing on my mind. I was thankful that we made it through that day and that I had medicine to give my daughter that helped her to feel better. I was also thankful that we were able to go to the doctor to have her looked at and to be reassured as new parents that she would indeed get over this illness. I know that far too many people do not have these luxuries which should be a given. I ate a big bowl of lentil soup with kale that I made, too, and that was very good. Again, I am thankful. Thanksgiving happens to be one of my favorite holidays. A holiday centered around family and good food, how can you go wrong? I was excited to share this holiday with my husband’s family here in Germany but due to the aforementioned circumstances I won’t be celebrating our Thanksgiving here until this coming weekend. We bought a farm-raised turkey from a local farm last week. (S)he is patiently waiting for us in the freezer next to the packages of cranberries that are worth their weight in gold, since I paid almost that much for them! Be thankful for cranberries if you live in the States, I love to cook with them this time of year but a small bag here is about three to four times the price that you pay in the US. They freeze well so I am planing on making cranberry bread and homemade, whole-berry cranberry sauce with them this weekend, two of my favorite dishes at Thanksgiving. I will also make stuffing and mashed potatoes and sweet potatoes and pie. I think a good pumpkin pie would be nice and perhaps a pecan (if I can find them, another hard to find food item here in Germany) pie. I think I might go pie-crazy this year because I also have plans to make a lemon pie and a banana-cream pie, oh my! You can’t ever have enough pie can you? We’ll see, I guess. I look forward to spending most of the day on Thanksgiving in the kitchen and making all the different dishes that we only eat but once a year. I am usually at my dad’s house on this special day cooking and baking in the kitchen in the home where I grew up. My dad usually makes the mashed potatoes and de-bones our turkey before I stuff it and we put it in the oven for hours and hours. 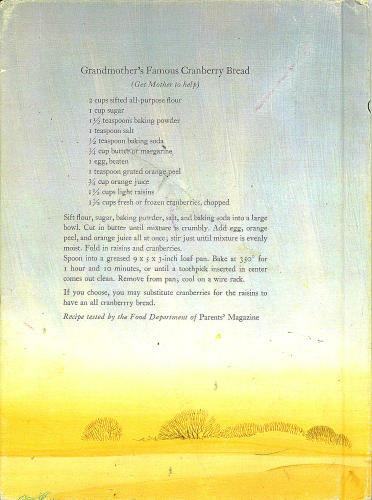 I am usually eating the cranberry bread that I just made that morning while making another batch of (vegetarian) stuffing for my brother and my husband (the two non-meat eaters in our family) by toasting slices of bread in the oven and then ripping them up into small pieces in a large mixing bowl. When the bowl is overflowing with toasted bread, I chop onions, celery and garlic add some bell’s seasoning or sage, rosemary and thyme, mix it all up with an egg or two and some vegetable stock and salt and pepper to taste. This makes a quick and tasty stuffing that’s fun to make. I used to love to rip up the bread when I was a kid and my mom was the one making the stuffing in our family kitchen. My mom would sit us kids down in the living room with bowls and towering piles of toasted bread while we watched the Macy’s Thanksgiving day parade on t.v. and ripped up bread for our turkey dinner. It was satisfying and fun and we loved to do it. 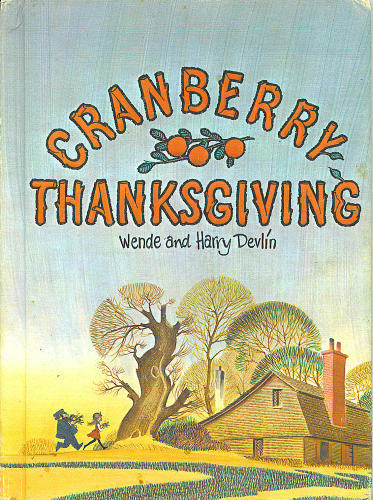 Here is a recipe for the cranberry bread that I make every year from the book Cranberry Thanksgiving by Wende and Harry Devlin, a book that I have loved to read every Thanksgiving ever since I was a kid. Sift dry ingredients into a large bowl. Cut in butter until mixture is crumbly. Add egg, orange peel and orange juice. Stir until mixture is evenly moist. Fold in raisins/cranberries. Spoon into a greased 9x5x3 inch loaf pan. Bake at 350° F for 1 hour and ten minutes or until a toothpick inserted in the center comes out clean. Remove from pan and cool on a wire rack. This is a great book which covers the basics of environmental problems, how they start, ways to mitigate them and activities you can do at home to become more aware of your environment. I used to love to pour over this book and try all the different experiments in it. It gave me a better understanding of the earth, how not to take nature for granted and that the land is a very precious thing.